(Austin, TX) January 28, 2014 – Austin Gives, an organization dedicated to recognizing and encouraging business philanthropy, awarded Zuma Office Supply for their outstanding efforts in giving back to the community. The awards ceremony to celebrate and encourage citywide giving took place at the Four Seasons Hotel in Austin, and included community leaders, local businesses and the nonprofits they support. John Paul DeJoria, co-founder of John Paul Mitchell Systems and Patron Spirits, was the keynote speaker, who spoke on the importance of business philanthropy in society. Austin Mayor Lee Leffingwell was also a featured speaker, and Judy Maggio and Walt Maciborski, anchors for KEYE TV, were the event’s emcees. Zuma Office Supply received the Charitable Champion Award for their support of nonprofits through monetary donations, and volunteered time. Their business model is structured to donate a minimum of 50% of the company’s annual profits to 10 nonprofits each year, which are selected through a voting process completed by Zuma’s customers while shopping online. Greg Pierce, President of Zuma, receives the Charitable Champions award at the Austin Gives event. Additionally, Zuma employee’s volunteer time through company-wide projects, which have included providing relief for those affected by the recent Austin floods and holiday food drives. Zuma’s Capital Area Food Bank food drive at Vandegrift High School raised an amazing 2850 pounds of food which equals 2375 meals for hungry Central Texans during the holiday season. In 2013, Zuma won 2nd place in the Capital Area Food Bank’s Small Business Challenge, and they also participated in the Salvation Army’s Shoe-In program which donated over 800 pairs of shoes and 2000 pairs of socks to school children in need of footwear. “We believe that business has a unique opportunity to help others and create positive social change,” said Greg Pierce, President and co-founder of Zuma Office Supply. “Volunteering and giving back to worthy charitable organizations adds immense meaning to our daily work lives.” Pierce went on to say that Zuma practices a Conscious Capitalism business model, and when businesses give back it’s good for the community, good for employees, and ultimately good for the business itself. As part of the award, Austin Gives donated $1000 on behalf of Zuma to the Austin Shelter for Women and Children, a shelter facility run by the Salvation Army. Other Austin Gives award winners included eBay and Coffee Bean & Tea Leaf for their extraordinary charitable work in the community. All three companies were recognized at the Austin Gives event. 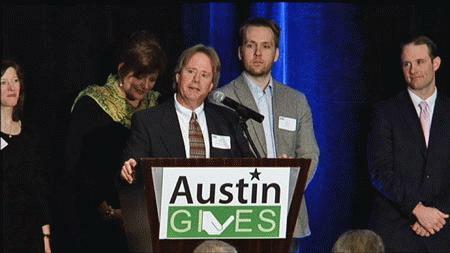 Other companies recognized by Austin Gives were eBay and Coffee Bean & Tea Leaf. Zuma Office Supply is an ecommerce office supplies retailer who provides over 40,000 various office products to businesses nationwide. Through their website www.ZumaOffice.com, they provide next day nationwide delivery for most orders, and have a business model that donates over 50% of annual profits to ten nonprofit organizations. Zuma is headquartered in Austin, TX. To learn more about Zuma Office Supply, visit www.zumaoffice.com, email gpierce@zumaoffice.com, customerservice@zumaoffice.com, or call toll free 877-473-4097. The Austin Gives GeneroCity Award Program was created to recognize Austin businesses that are leaders in giving back to community-based, non-profit organizations. Each year, one small, one medium and one large business is recognized at the annual GeneroCity Awards celebration. Award recipients are selected by a panel comprised of local community leaders, including Nikelle Meade of Husch Blackwell; John-Michael Cortez of Capital Metro; Olga Campos of U.S. Money Reserve; Denise Bradley of St. David’s Healthcare; and Bobby Jenkins of ABC Home & Commercial Services. To learn more information about Austin Gives or to join the organization at no charge, visit www.austingives.net, email info@austingives.net or contact Debbie Johnson, executive director of Austin Gives at 512-517-9485. This entry was posted in Office Supplies and Charities and tagged Austin Gives, Charitable Champions, conscious capitalism, Do Good Work, GeneroCity Awards, Giving Back, John Paul Dejoria, Judy Maggio, Lee Leffingwell, office products, office supplies, Salvation Army, Zuma, Zuma Office Supply. Bookmark the permalink.